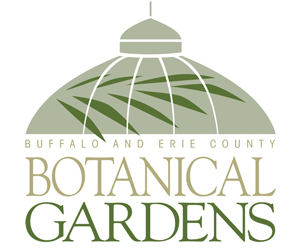 Spring is an overlooked time for gardens in the Buffalo area. It seems we spend our time waiting and preparing for the end of May, the traditional time to plant tender annuals, and we forget to pause and enjoy the beauty of spring gardens. With perennials, you can have successive waves of blooms in your garden starting in early spring, said Fran Evans of Hamburg, who is a Master Gardener with Cornell Cooperative Extension Erie County. I visited his garden yesterday, and even overcast skies couldn’t dim the beauty of the gardens. Spring blooming is well underway, and the bulbs have already finished. Now other flowers carpet the garden. In the first photo, you can see pastel-colored Spanish hyacinth and Virginia bluebells. Virginia bluebells are hard to transplant, Evans noted, because you must dig up the entire tap root, which is very long. 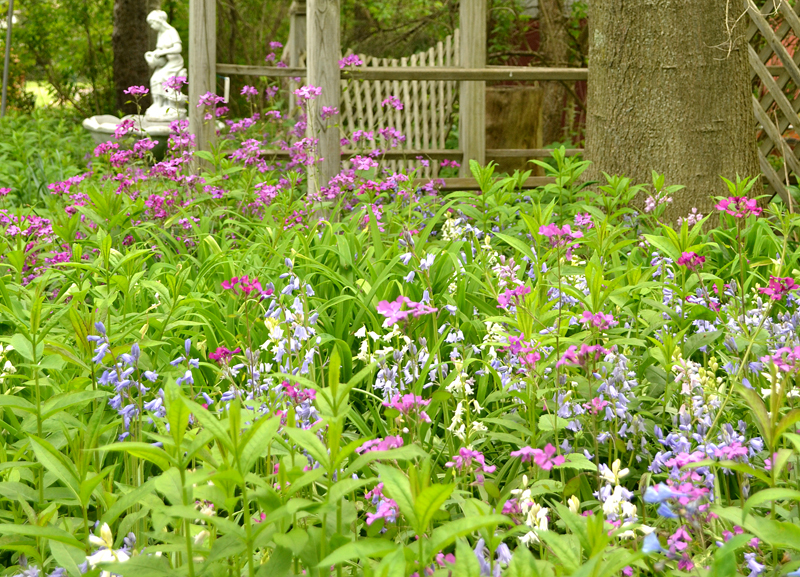 Dotted among the Virginia bluebells are the dark purple blossoms of lunaria or money plant. When lunaria goes to seed in late summer, it will get seed pods shaped like coins with a silvery, translucent paper-like membrane. Stems of the money plant are often used in dried arrangements. Evans also has leopard’s bane (doronicum), a yellow daisy-like flower, as well as fragrant lily of the valley. There are plenty of forget-me-nots, a delicate, low-growing flower that is normally blue. 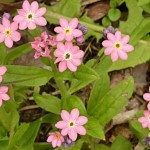 Evans pointed out a few forget-me-nots that, after reseeding themselves for multiple generations, have come up pink. You can see them above left. When we think of flowers, we generally think of low-growing plants, but we shouldn’t forget about bushes and trees, especially in spring. 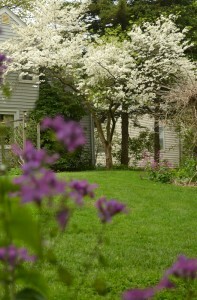 The white dogwood tree at right, is in its prime and is covered in flowers. Another source of flowers in the garden now is a showy bush called kerria japonica, which gets yellow blooms that look like buttercups. The fragrant lilac bush, below left, is nearly done blooming. Already this year Evans has enjoyed flowers on forsythia bushes, a redbud tree and crab apple trees. Evans has shady areas, and those areas have flowers, too. 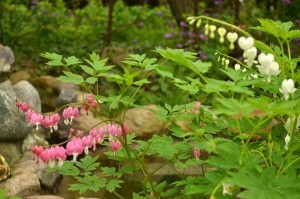 Bleeding hearts, seen below right, grace the area around his pond. He noted that the white bleeding hearts are beginning to crowd out his red ones. 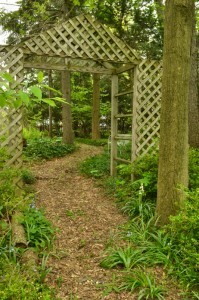 Native plants including trillium, bloodroot, jack-in-the-pulpit and mayapple thrive in the shady spots, and a path winds through a wooded area, seen below left. 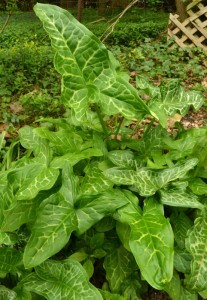 An unusual plant for the shade is arum italicum, the last photo on right, which can be used as a ground cover. Last year Evans planted one plant. The next week he had four plants, and the week after he had nine plants. As you can probably guess, it can be extremely invasive. The roots sprout bulblets, and new plants grow from the bulblets as well as from the roots, he explained. Evans also has a vegetable garden, and he’s not waiting until Memorial Day to plant. He is already growing cool weather crops including six kinds of lettuce, peas, onion sets, radishes, beets (round and cylindracal) and kohlrabi. He also planted beans and corn last week, which need soil between 50 and 60 degrees Fahrenheit six inches down. There’s still a risk of cold weather, but Evans said that in 20 years, he’s had to cover the plants only once. There are more flowers to come in Evans’ garden. The lilies are doubling in size every week and will soon be blooming. 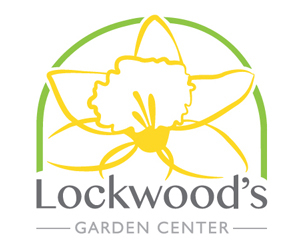 He has many perennials, including clematis and a huge trumpet vine, that will draw attention with their flowers in the following weeks and months. To keep perennials blooming in your garden from March until October, you’ll need 10 or 20 different kinds of plants, Evans said. Each perennial will bloom about six weeks, and you want some overlap of the blooming times. Choose trees and bushes first since they’re larger, they take up more space and they’re harder to move. Then choose perennial flowers. Evans divides the blooming season into three general parts: early, middle and late, and we’ve included some suggestions below to give you an idea of plants that should appear at those times. The time that each plant actually blooms depends on several factors. One factor is the microclimate in your garden– daffodils on the sunny side of my house bloom a week or two before the daffodils that are shaded by the porch. Another factor is our weather. Our summer-like temperatures earlier this spring caused some plants to bloom a month early, while the unusual weather is now delaying the blooms on Evans’ locust. In addition to the perennials, Evans plants an elaborate annual garden each year that uses about 700 plants. He uses 35 shop lights in his basement to start $350 worth of seeds to get the number of annuals he needs. He estimates it would cost him $2,000 to buy the specimens as plants rather than starting them from seed. That’s just one more technique Evans uses to keep flowers in his garden throughout the year. “There will always be blossoms,” he said. Beautiful flowers! It’s nice to see some of my favorites. Eileen, Fran has done a beautiful job with his garden. 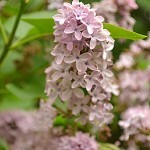 Lilacs are one of my all-time favorites, and he introduced me to some plants I’ve never seen before, too. Thanks for writing. Penny, that’s a great list of plant suggestions. Thanks for sharing it. I love your Aesculus pavia. It’s beautiful! I’m glad you took the photo. Thank you Connie, I included the link to the photo because most people in this area may not be familiar with it and thought some might like to see one.. It is native to the eastern US and is perfect for small city gardens as it only get between 10 – 15 ft tall at maturity, unfortunately it is another one of those fantastic plants that is impossible to find locally. I had to order mine online. Another attribute of this tree is that they can start to bloom when they are only 3 or 4 ft. tall (Mine is 6ft. tall right now) and of course they are an early source of natural nectar for spring migrating hummingbirds as well as Baltimore Orioles.